Halloween is the perfect time to talk about the next classic horror movie villain. Even though we're not rewatching the Halloween episode just yet, Buffy the Vampire Slayer Season 2 Episode 4 did bring out the mummy. We got everything from the ancient curse to the life-sucking demon. And even though we didn't get the bandaged-wrapped villain, Ampata was inspired by it. But, did we need to see the mummy? Let's find out by rewatching "Inca Mummy Girl." Sunnydale High playing a part in the student exchange program was a strange plot device. It doesn't seem like something the school, or many of the characters, would do. Like, why would Buffy OR Cordelia agree to this program? Cordelia likes to get involved, but she is more self-involved as a character. She only does things that benefit her and her standing in the school. And Buffy/Joyce are more focused on their own lives. This plot felt more as a way to explain Ampata being integrated within the Scoobies. I could also just be too critical. Did your school ever do the exchange program? Rodney trying to steal the mummy's seal didn't make sense. Even as a bad kid, he would have better sense than to grab something from the museum. I guess he was made to look dumber than he was. A lot of Xander's dialogue supported this backstory. We needed to believe Rodney would try to take something. But why the seal? In a building full of artifacts worth thousands of dollars, he goes after the plate being held by the mummy? I don't buy this. Willow: On the other hand, maybe Rodney just stepped out for a smoke? 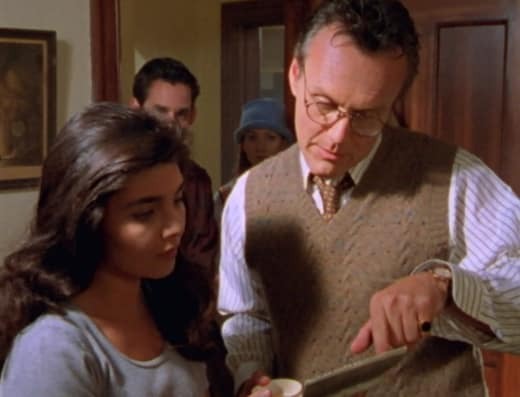 Giles: We'll deal with that when we've ruled out evil curses. Buffy: One day, I'm gonna live in a town where evil curses are just generally ruled out without even saying. Permalink: We'll deal with that when we've ruled out evil curses. I love the moment when the joke turns to reality on the Scoobies's faces. The minute Buffy said it you could tell the realization dawned on them. Nothing is ever a random idea; it's always a possibility. Anywhere else in the world, the idea of a mummy attacking someone could be brushed off. I would brush it off. But not in Sunnydale! "Inca Mummy Girl" is just the latest Monster of the Week to make its way to town, and Rodney is simply the latest victim. Why did the mummy go after the real Ampata? She could have chosen ANYONE in town to steal their life force and lived a separate life from the Scoobies. Furthermore, I don't think the museum and the Sunnydale bus station are even close to each other, so the mummy would've had to travel there unknowingly to kill him. The plot holes are too much. I like Ara Celi as the mummy girl. She was sweet, kind and I felt sympathetic to the struggle of the villain. She didn't want to do evil for the sake of evil; she merely wanted to live the life that was taken away from her. It's understandable from an objective standpoint. However, similar to Buffy the Vampire Slayer Season 2 Episode 2, it doesn't her excuse her from doing bad to get it. Poor Willow! My heart broke for her. She is too good for Xander. The upside of her overhearing Xander's chat with Buffy was that it helped her to move on. She couldn't (and shouldn't) wait around for him to realize how amazing she is. He had his chance on Buffy the Vampire Slayer Season 2 Episode 1 and he wasted it. I've mentioned before that Willow is a strong character. She did the right thing by convincing him to ask Ampata out. It helped her say goodbye more than help her friend. Buffy: Ampata is only staying two weeks. Willow: Yeah, and then Xander can find someone else who’s not me to obsess about. At least with you I knew he didn’t have a shot. Well, you know, I have a choice. I can spend my life waiting for Xander to go out with every other girl in the world until he notices me or I can just get on with my life. Permalink: At least with you I knew he didn’t have a shot. Xander clearly had a thing for Ampata. He loved going after the new girls, and he especially had a thing for supernatual girls. Whether it was unknowingly or not. I'm critical of Xander because he makes poor decisions and demeans people. However, he was strangely a nice guy around Ampata. She elevated him up to her level and he treated her with respect. It's a shame he didn't follow this same method with his other relationships. Even though I liked them together, was Ampata really in love with Xander? I don't think so. It was too fast for that to develop. She had a teenage crush on him and when confronted with the possibility of losing him, her feelings were all mixed up. Come on! They only knew each other for a few hours. Ampata was being a bit dramatic with her decision. Xander: Okay, I have something to tell you. And it's kind of a secret and it's a little bit scary. I like you. A lot. And I want you to go with me the dance. Xander: Well, because you never know if a girl's gonna say “yes”, or if she's gonna laugh in your face and pull out your still-beating heart and crush it into the ground with her heel. Ampata: Hmm...then you are very courageous. Permalink: Hmm...then you are very courageous. He had supposedly trained for many years to make sure the mummy was kept in her tomb but he failed in both of their fights. Ampata doesn't seem like the strongest fighter. He phoned it in. We could've had anyone else help the Scoobies will taking down the mummy. And yet. we got him. He's like the Watchers's Council...so pointless. 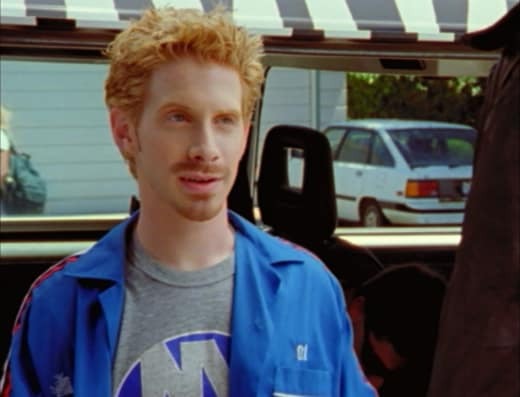 Oz was introduced in Buffy the Vampire Slayer Season 2 Episode 4?! His surprise arrival caught me off guard. I knew he premiered somewhere earlier in Buffy the Vampire Slayer Season 2, but I didn't realize it was "Inca Mummy Girl." It fits since this was the moment Willow started to move on from Xander. The Willow and Oz relationship was one that was pure high school sweetheart. From the outside, they seemed like endgame but it was never meant to be. Both of them were off-beat and nice, and they complemented each other so well. If you're a fan of Oz, enjoy these next two seasons because he changes a lot come Buffy the Vampire Slayer Season 4. And if you thought Oz appearing was the only strange introduction, just look out for Jonathan! The future villain of Buffy the Vampire Slayer Season 6, and ongoing recurring character, makes his first appearance at the dance. It's surprising to think this random one-off background character would become an important player later on. He definitely put the work in to get a bigger profile. Let's talk about the school dance for a second: who approved this idea? There was so much wrong with the execution of the dance. A lot of the costumes by the students were bad stereotypes for the most part. I wish we could blame it on a Halloween episode but we can't. Luckily they toed the line for as much as they could in the 90s. However, if they had tried something like that now, "Inca Mummy Girl" would've been roasted on Twitter. The GIFs and memes alone would last a lifetime. 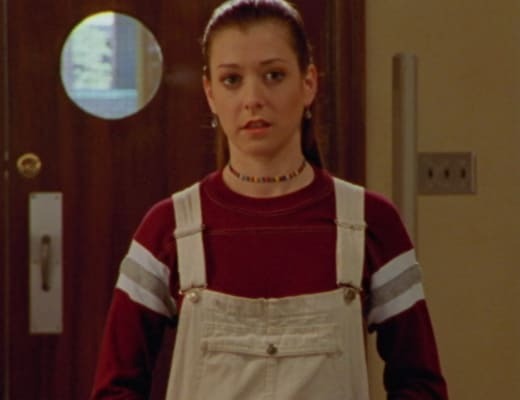 Still, we were treated to Willow's iconic costume. Her choosing to go as an Eskimo in full layers is something her character would absolutely do. This small moment was a genuinely sweet scene for the character, and Oz noticing her in the crowd touched my heart. Oh! Near faux pas. I almost wore the same thing. Permalink: Oh! Near faux pas. I almost wore the same thing. Cordelia was at her worst in "Inca Mummy Girl." She was so mean to her exchange student, Sven. Sure, he wasn't exactly who she expected him to be, but she didn't need to treat him like that. All he did was not engage with her. The twist of him speaking perfectly English was hilarious. If only Cordelia treated him nicer, he may have considered talking to her. Ampata and Xander had great chemistry together. I will admit it was sad to see their budding relationship come to an end. Especially after it heated up so quickly. As much as she claimed to be in love with him, I wasn't surprised one bit when she tried to kill him. She loves life. She never had one and given the chance, she would do anything to keep it. We shouldn't hold it against her too much; she has had a rough time. 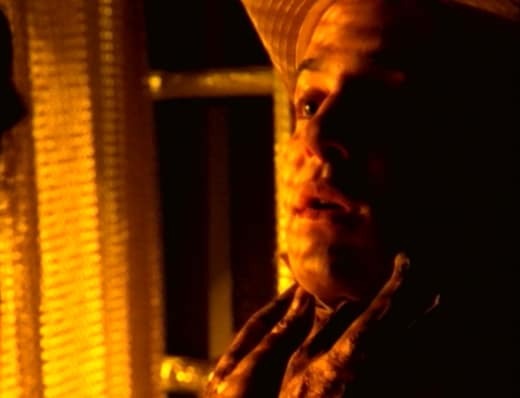 "Inca Mummy Girl" isn't the most complex or interesting of Buffy episodes. It's pretty standard fare with its mix of teen drama and supernatural activities. However, it does introduce many elements that play a bigger part in the series. We got Jonathan and Oz introductions, and Willow moving on from Xander. I wouldn't give up any of those plot elements. If you're a big fan of those storylines, this is a must for rewatching. What did you think of "Inca Mummy Girl"? Were you sad for Xander over his dating disaster? Did you like Oz from the beginning?